I was planning to make this super fingerlicking famous Kerala's ulli theeyal since a long, when Srivalli announced this month's blogging marathon themes, she proposed a variety of very interesting themes as usual. While going through her themes, i know i'll go immediately to the theme 'cooking with onions'. Coz i cant imagine cooking my foods without onions, my onion basket will always have white onions,shallots and also i'll get quite often spring onions from farmer's market. 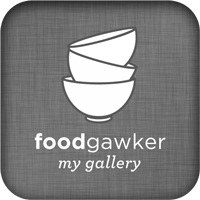 So the next three days will be dishes with onions as star ingredient for this week of blogging marathon. Theeyal is a typical Kerala dish prepared with a roasted coconut and few spices by roasting the coconut until it turns golden brown. 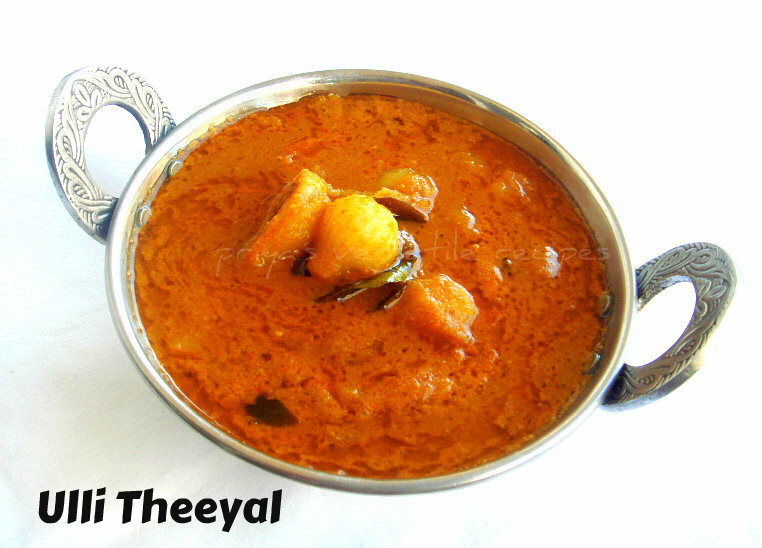 Actually theeyal means burnt dish, its quite a long i wanted to make this ulli theeyal. Recently i picked shallots just to make this famous ulli theeyal and oh god i dont have words to explain how tasty this fingerlicking gravy is. Serve this gravy with rice and papads, i can have this yummy gravy even everyday.Check out the other marathoners running this 20th edition of blogging marathon here. Heat a teaspoon of oil, roast the grated coconut in medium flame, stir continously and roast until its turns dark brown, add the coriander seeds, dry red chillies to the roasted coconut and fry until the spices gets well roasted. Take this roasted coconut and spices in a mixie jar,grind as fine paste with enough water and keep aside. Heat the oil,saute the shallots for few minutes, add the tamarind extract,turmeric powder, salt and curry leaves and cook until the shallots turns tender. Now add this already grounded paste and cook everything for few minutes, dont let it boil and put off the stove. Heat oil for tempering, fry the mustard seeds, fenugreek seeds and broken chillies until brown, remove the tempered spices and add to the cooked theeyal. Love ullitheeyal with steaming rice..yummy & mouthwatering!! Yummy theeyal...Love this along with steaming rice...Makes a delicious lunch dear..
loving the flavors in this dish..n it looks so inviting.Book marked!! delicious curry on its own....by shallots you mean the small sambhar onions? Looks so good, I can smell the flavor from the roasted coconut paste..
As always, nice clicks and makes me want to enter the kitchen and prepare it now! What a delicious dish Priya! I was planning for this for my onion recipes but now have to look for something else :). Looks so delicious, want it with some hot rice. OMG,what a colourful n tangy gravy...wish to have taste now itself!! Looks lip smacking! Nice recipe priya! I bet this is any Keralites fav dish! I just love the flavour of it! Now i am craving for it!! super tempting!! 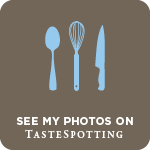 Join me in Fast Food - Pasta event and know your sweetness - Honey event in my blog. Wowo droolie delicious, jus tlooking at the gravy itself i am drooling here. Wow what a wonderful looking gravy priya..I know this tastes great! Lip smacking dish. wish to try soon..
Love shallots in any dish. And roasted coconut gravy adds another dimension to the curry. In my city we do not get peeled shallots and that is the only thing that keeps me from buying them every time I go to the store. Would love to have some with rice right now. I have been wanting to try this recipe. i am bookmarking from you Priya! This looks so delicious, my mouth is watering just seeing the picture. YUM! lovely dish, one of my favorites. I make a little differently though. Am not a theeyal fan but I have never tasted theeyal that looks so appetizing before. Most theeyals that I have tasted seem too spicy and full of masala but I must admit I never made it myself. So thanks, Priya, for sharing this recipe. I think I will give it a try and make it. Oh man, that is one delicious gravy. Looks mouthwatering. awesome.. look totally rich in gravy..